It seems to be the [tag]nature[/tag] of [tag]pumpkin[/tag]s and [tag]squash[/tag] and that sort of plant to grow abundant vines and millions of tall stalks with [tag]blossom[/tag]s bursting forth at the ends. Without looking up some resource on the physiology and morphology of these types of plants, I am guessing that these tall blossoms, that never turn into something like a squash, [tag]zucchini[/tag], or pumpkin, are the “boy” parts, releasing pollen. These blossoms are constantly visited by [tag]bee[/tag]s which turn a sunny orange-y yellow from their visits into the [tag]pollen[/tag] laden blossom interiors. You can stand in a patch of these plants, surrounded by MANY buzzing bees and not fear a sting. They are pollen-[tag]besotted[/tag] little fuzzy things not unlike the [tag]salmon[/tag] obsessed [tag]grizzlies[/tag] in the [tag]Kenai[/tag] in [tag]Alaska[/tag]. I have been mostly enjoying the bee circus without much thought for the blossoms until Curt of [tag]Bucky’s BBQ and Bread Blog[/tag] suggested that I pick them and [tag]fry[/tag] them up. I filed that away in the virtual recipe box (the brain) with a thought of getting around to it before the blossoms were all spent. 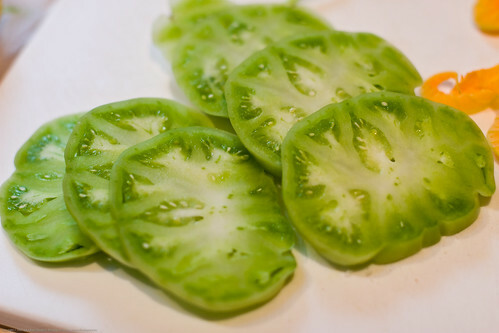 When one of my [tag]beefsteak[/tag] [tag]tomato[/tag]es fell early and green I decided it was time to make some [tag]fried green tomatoes[/tag] and s[tag]quash blossoms[/tag]! Recently, I have been reading “[tag]Nourishing Traditions: The Cookbook that Challenges Politically Correct Nutrition and the Diet Dictocrats [/tag]” by [tag]Sally Fallon[/tag], a book that helps you understand just how bad [tag]transfat[/tag]s and vegetable oils are once used for cooking. A good alternative is [tag]organic[/tag] [tag]coconut oil[/tag], which has a very high burning point. One wants to use only these sorts of fats in high temperature cooking because oils like [tag]canola[/tag] and [tag]corn[/tag] and such will break down and form all manner of [tag]DNA[/tag] chewing free radicals. I can not recommend this book highly enough. Finding organic [tag]coconut[/tag] [tag]oil[/tag] can be hard and once you do, it will make your eyes water due to the expense. Why organic? High throughput (industrial) methods of preparing coconut oil uses nasty organic solvents (organic as in chemistry) that remain [tag]partitioned[/tag] into or “stuck” in the coconut oil, no matter how “pure” the manufacturer claims it is. I went out to the [tag]garden[/tag] and harvested [tag]squash[/tag], [tag]zucchini[/tag], green and [tag]lemon cucumbers[/tag], and blossoms from spaghetti squash, pumpkins, and zucchinis. I had to evict quite a few bees and other nectar-loving bugs. One or two bumblebees put up quite a fight. I will write about the [tag]cucumber[/tag]s I made into lacto-fermented [tag]pickle[/tag]s in a while, once they have had some time to set up and I can try them (and shoot them). I pulled out my [tag]Japanese[/tag] [tag]tempura[/tag] [tag]batter[/tag] (instructions all in Japanese so I just use 1 cup ice water to 1 cup mix), made it up and stuck it in the freezer to cool (with a few ice cubes in it too). I also used [tag]panko[/tag] crumbs. I cut the green base off the bottom of the squash blossoms and double checked for occupants. I didn’t wash them, didn’t seem the right thing to do. 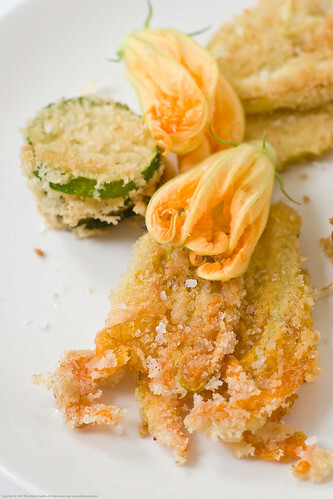 I sliced the tomato, zucchini, and [tag]scallopini squash[/tag] into 1/4 inch slices, dipped them and the blossoms in the cold tempura batter and then the crumbs and then fried in a cast iron pan with a 1/8 inch layer of medium hot coconut oil. This slideshow will give you a sense for that process. Once cooked, I removed them from the oil and salted them. Anything [tag]fried[/tag] is fantastic but if its fried in coconut oil? Oh my goodness, it is fantastically delicious, miles and miles better than any fried item I have tasted before. 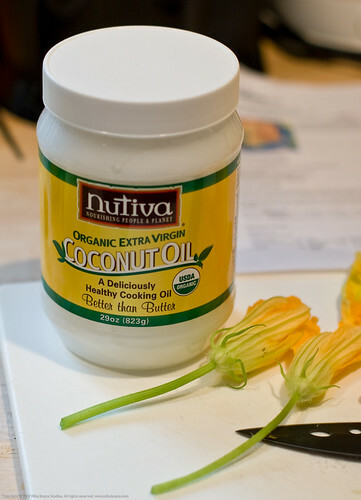 Give it coconut oil a try, you will not be sorry. Munch on your fried blossoms as you read your new copy of Nourishing Traditions. I’d never actually battered the blossoms, but I bet they were great! So are the blossoms something you’d do again? I tried them without the panko and just the batter and they were not the same .. so you suggest with nothing at all? hmm, will try that too. will definitely try it again .. am thinking of stuffing them with something, not sure yet what, going to surf the web for some recipes. When I’ve done them, I just rinse them and put them in some flour, then fry them. The panko breadcrumbs without the batter might be worth a try. I dont think the panko will stick unless the blossoms are wet, I guess after the rinse would do. I know that fried blossoms is a favorite mexican dish, am going to see if my Bayless books have a recipe for them. I’ve never used coconut oil, but now I will have to try it! 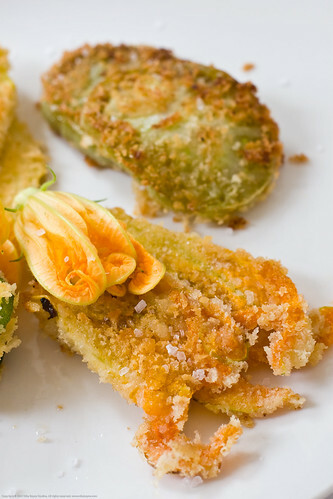 Wow – I’ve heard so much about these fried flowers before – squash blossoms, zucchini flowers, you name it. They look sooo tasty, and this coconut oil puts a real twist! I’m so impressed. Cute post title too! Lydia: let me know what you think! Hillary: Glad you like the title Titles can be sort tricky but this one seemed to suggest itself. I to had heard about these blossoms but have never seen where to buy them. Now that I had lots of them, I finally got a chance to try them. Next thing, I am thinking about something like a crab rangoon stuffing in the blossoms .. yummmmm. I usually stuff mine with a shrimp mousse amd then tempura batter them. The tempura batter gives it a nice light crunch. for my tempura batter I use 1 cup flour 1 Tbs corn starch or potato starch 1 egg and 1 tbs baking powder and 1 cup ice cold soda water the soda water is very important to the lightness of the batter. Brian: goodness, that sounds great. So the mousse is an egg white base versus some sort of cream cheese mix (I have seen that on the web elsewhere and wasnt sure if that would not just make the blossoms be little bricks). Will try that tempura batter next time. Ever tried it with other types of bubbly sodas/drinks?